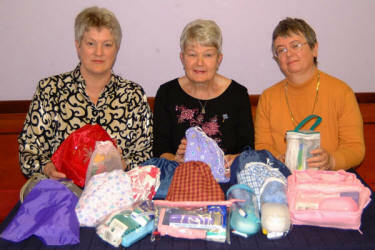 Office bearers of the Derriaghy branch of the Mothers’ Union branch are pictured with filled toilet bags for use by emergency patients at the Lagan Valley Hospital. L to R: Pat Allen (Secretary), Trudy Hull (Chairperson) and Margaret Hanthorne (Treasurer). For the past couple of years, ladies from the Derriaghy branch of the Mothers’ Union have been filling toilet bags for use by emergency patients at the Lagan Valley Hospital. Under the leadership of Mrs Trudy Hull (chairperson) the ladies have been doing this voluntary work as part of a nationwide Mothers’ Union project.